Mechanical Turnstile by CAME is the compass. The ideal solution for selecting pedestrian transit. A simple cost effective solution for truly effectively managing people flows. Available with either clockwise or anti-clockwise openings and also bi-directional. Can be coupled with modular barriers to complete installations. KELRYAN – Sales, Installation & Service 1300 535792. Servicing clients in Sydney, Wollongong, Newcastle, Canberra, Singleton, Nowra, Ulladulla, Sutherland, Campbelltown, Homebush & Eastern Creek. Mechanical Turnstile by CAME is the compass. The ideal solution for selecting pedestrian transit. A simple cost effective solution for truly effectively managing people flows. Available with either clockwise or anti-clockwise openings and also bi-directional. Can be coupled with modular barriers to complete installations. Finished in AISI 304 Grade Stainless Steel is designed to suit any outdoor or indoor high traffic flow environments and will compliment its surroundings with nicely designed curves and quality finish . Mechanical turnstile can be installed freestanding, fastened to floors and/or walls. 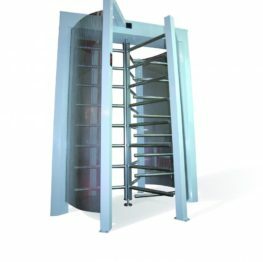 Turnstile can be supplied in either left hand and right hand configurations to suit specific site installation or site requirements. KELRYAN – Sales, Installation & Service 1300 535792. Servicing clients in Sydney, Wollongong, Newcastle, Canberra, Singleton, Nowra, Ulladulla, Sutherland, Campbelltown, Homebush & Eastern Creek. Be the first to review “Mechanical Turnstile” Click here to cancel reply.